A way around FBAR/8938 reporting using LockSmart? According to the IRS comparison of these requirements, “precious metals held directly” is not reportable. So what does “held directly” mean? The IRS’ own Q&A confirms that safe deposit boxes are not reportable but otherwise provides no explanation of the term. Last week I wrote about the gold warehouses associated with the CME’s kilo futures contract. Today I’ll have look at the Comex New York warehouses but rather than focusing on the eligible/registered debate, which has been done to death, I want to look at the fight between the warehouses for storage customers and the entrance of JP Morgan into this $30 million per annum business in early 2011 (hence my tacky topical title). Read more here. Back in July I pondered what happened to 110 tonnes of gold in one of the Hong Kong gold warehouses registered by CME for its kilo futures contract. The chart below updates the figures and shows that wherever the gold went, its is gone for good. Those that get worked up about Comex “leverage” ratios should be interested in the fact that the Hong Kong warehouse report only shows eligible stocks and has never shown any registered, which probably has something to do with the fact that the delivery notice report shows no issues/stops for the kilo contract so far this year. Forget your 300:1 Comex “leverage” – that would put the OI/Registered Stocks ratio as divide by zero error, or in other words, the CME’s Hong Kong contract has infinite leverage! In July I did a post on How much gold does China really have? which looked at the rate China was accumulating gold reserves based on their occasional announcements of how much gold they had. Extrapolating out their average monthly rate of 8 tonnes gave the chart below, which projected to 2,186 tonnes by the end of 2020. Since then China has begun to report its gold reserves every month and has accumulated 86 tonnes in five months – an average of 17.2 tonnes. That is a lot more than their previous rate and you can get a better idea of the acceleration if I update the chart above with the new reserves figures and then project that rate into the future. Read more here. The Perth Mint’s latest minted coin and bar sales are out, which reflect retail investor interest. In silver we posted our fifth best month in four years, although the September figure probably should be ignored because we were stocking up for months beforehand for the launch of our silver Kangaroo coin and didn’t expect to sell that all in one go. Read more here. Proponents of a Gold Standard look forward to the day when people use gold and silver coins as money but it seems that beer and spirits have a head start. This article sheds light on hundreds of secret Facebook groups in Australia where people barter goods and services for alcohol in various forms, with one group claiming 50,000 members. Today the Perth Mint and Australian Securities Exchange (ASX), one of the world’s top-10 listed exchange groups measured by market capitalisation, announced that they would be collaborating on developing new exchange traded precious metals products. The first product is mostly likely to be a gold futures contract deliverable in Perth. Given the focus the gold community has on futures markets, and Comex in particular, I’m sure there will be a lot of interest is this Aussie gold contract. As we are in the process of talking to the market about what features they would like, it is not possible to get into contract specifications at this time but I can make some general comments about the approach ASX and Perth Mint will be taking. The idea that the US Mint has a legal obligation to mint and issue bullion coins in quantities sufficient to meet public demand is one that I have seen mentioned every time the US Mint puts its bullion coins on allocation. While originally true, it is no longer the case. FYI, you'll also like Sec. 5116 authorising the Secretary of the Treasury to sell gold. Those who frequent the precious metal forum www.silverstackers.com will know the name goldpelican, who is the forum administrator as well as one of the guys behind http://www.goldstackers.com.au/store. Well he has just started a blog called Five Metals and his first post is on a favourite topic of mine - excessive coin premiums. Worth adding to your blog reading list. The chart below from WSJ via Zero Hedge shows a complete lack of consensus amongst banks as to gold's future direction. That may translate into a sideways market as participants compete on their view. Thankfully there doesn't seem to be many forecasting prices below $1000. Strangely, many gold ‘experts’ assert that gold is different due to its dominant monetary and store-of-value roles, but then insist on applying a traditional commodity-style method of supply-demand analysis. Yep, it doesn't make sense to treat gold the same as a commodity like orange juice futures. 1) Lie to people who want to be lied to, and you’ll get rich. 2) Tell the truth to those who want the truth, and you’ll make a living. The first category explains why there is so much crap out there. I think I've spent too much time in the past doing the third. I'll leave it up to you to work out which of the gold bloggers/commentators out there fit into which category. As Jayant Bhandari observed in his Precious Metals Investment Symposium presentation, India is a negative-yielding economy, with nominal yields on property and stocks below the 10 year government bond (even cows return -6% assuming zero labour costs). In such an environment, a zero-yielding asset like gold is better than a negative yielding asset. The Indian government’s gold monetisation schemes, however, are more about addressing the symptom rather than the disease, which is the lack of trust in “payback”. Jayant says that high levels of corruption, superstition and irrationality in India “discourages accumulation of financial and intellectual capital”. But dealing with that, I guess, is a lot harder than trying to hoodwink “its population to take a leap of faith on the trust front”. “the risk of increase in gold price that will be borne by the government” and they “will not be hedged and all risks associated with gold price and currency will be borne by GoI”. With that sort of risky behaviour from their own government, who really is stoopid – those holding physical gold or those trusting the government schemes? Last week I was in Sydney for the Precious Metals Investment Symposium. While the turnout was down on last year (surprising as the Australian gold price has been performing but I suppose people just look at the US price) the speaker turnout was excellent. For me the standouts were opening speaker John Butler, Keith Weiner and Jayant Bhandari. The presentations by Keith and Jayant were complimentary, with Keith covering his idea of yield purchasing power and how low interest rates were resulting in people eating their seed corn, and Jayant explaining why countries like India are so interested in gold (zero yield is better than negative yield), forecasting that the West is headed in the direction of negative yields/capital destruction. On Monday night Mark from Gold Stackers roped me into helping him with the launch of the Back to the Future coins, which involved me putting on white coveralls and a wig to “act” as Doc Brown in a skit (emphasis on the double quotes around the word act). It was all good fun but thankfully I have not seen any pics of our attempt at acting circulating on the internet. Tuesday night saw the Precious Metal Award Gala Dinner at which I was humbled to win the ‘Maggie’ Bullion Award, which is named in honour of an Australian coin dealer known for her exceptional focus on customers, who died unexpectedly last year. Towards the end I also discussed why gold has not responded to recent geopolitical and economic events, which is based on my view that everyone has a different level of trust in the politicians and central bankers to keep things under control. Dave Fairtex, writing for Peak Prosperity, claims he has The Smoking Gun Proving Silver & Gold Manipulation. In identifying all of the 0.5% or greater one minute price spikes over the past 6 years I’d argue he has proven how infrequent it is. “Fourty four years after the end of the Bretton Woods System global central banks have manipulated the cost of risk in a competition of devaluation leading to a dangerous build up in debt and leverage, lower risk premiums, income disparity, and greater probability of tail events” says Chris Cole of Artemis Capital in his recent paper titled Volatility and the Allegory of the Prisoner’s Dilemma: False Peace, Moral Hazard, and Shadow Convexity. Towards the end of 2010 I started recording forecasts in a spreadsheet, as I noticed many analysts revised their forecasts frequently in response to moves in the gold price. By 2012 I had given up as it was a lot of work to make one point – that in general analysts were just following or projecting the trend. Some may recognise the influence on the post title. I started to muck around with the original but haven't been able to get too far. Maybe those with more creativity could make some suggestions. Not sure what the Albatross should represent. 'There was a newsletter,' quoth he. The Goldbuggee hath his will. And mumbled in his beer. Out from the lows came he! I lose the whole lot matey. The bear was all around. How much gold does the Chinese Government really have? I don’t want to pick on Societe Generale analyst Robin Bhar, as this was representative of most of the commentary around China’s gold reserves announcement, but the statement that the 1,658 tonne figure “was not unexpected. If anything, it was slightly surprising that it wasn’t more, the market was looking at a figure north of 2,000 tonnes” makes the mistake of assuming that Central Bank announcements are about communicating facts. I don’t know if this is the case in other countries, but here in Australia the TV news and other media report the USD gold price, not the AUD price. The result is that often gold will only appear in the local news when the USD price does something interesting or achieves new lows or highs, when for local investors the gold price may not have changed much or moved in an opposite direction. Where did 110 tonnes of CME Hong Kong gold go? Some quotes from https://www.quantamagazine.org/20150714-explosive-percolation-networks/ - just replace "D'Souza" or "one" or "we" with "Government" and you might see why I find this article disturbing (my emphasis). Public relations professionals often ask how D’Souza’s work might help their products go viral. She typically responds by pointing out that her models actually suppress viral behavior, at least in the short term. “Do you want to eke out all the gains as quickly as you can, or do you want to suppress [growth] so when it does happen, more people learn about it right away?” she said. China to control the gold price, but with physical or paper? Some thoughts on Texas' bullion depository http://research.perthmint.com.au/2015/07/13/the-texas-bullion-depository-is-not-a-joke/ Have to say I was surprised at the way the media made fun of it, show their hate of gold. Have a post up on the impact of the China stock market crash on gold demand and wondering if it is fair to ask: goodbye Chinese stock bubble, hello Chinese gold bubble? Gold’s strength in face of market sell off, is the bottom in? “Gold is strong,” I hear you ask, “are you crazy?” Yes, gold fell just below $1150, but in relative terms think it performed OK over the past 24 hours. Have a post up on the corporate blog on the permanent portfolio and specifically the Australian fund Cor Capital which has implemented the strategy. It shows a safe and consistent return that I think argues well for the strategy's inclusion in retirement accounts. Read more here. I have been very busy over the past few months, a few projects coinciding, and also working to set up a blog for myself at the Perth Mint - research.perthmint.com.au hence the lack of posts. I've moved the content from the Research section of the Perth Mint to the blog to seed it but the first real post on the new London fix is now up. I will be trying to maintain a daily schedule and part of that I will go back over this blog and revisit/rewrite some content that is evergreen in nature and worth bringing to new readers' attention, after around 7 years and 450 posts otherwise useful material can get lost. I also plan to redo my most popular post on gold confiscation, incorporating a lot of material gathered since I wrote it as well as comments from those I've discussed the issue. Putting together all of my fractional reserve bullion banking posts is also probably worthwhile, so much misinformation on that topic. The new corporate blog will be where I will put most of my serious or sensible stuff, but this blog will remain for truly personal commentary on the PM markets that the Perth Mint just can't host. This blog has been an awkward blend of personal and work which necessarily restricted overly blunt and pure opinion content (yes I have been restrained), but I hope to make the distinction clearer so that this blog has the "space" where I can rant a bit more. I'm not sure exactly how personal I can be, given the recent case of Scott McIntyre, who was sacked for comments "calling Australia’s involvement in the World Wars an 'imperialist invasion of a foreign nation'." The excuse given for the relevance of the sacking was "It’s not tenable to remain on air if your audience doesn't respect or trust you.” Is this justified only because he had a public role, would someone without any public facing role saying the same thing which it is then discovered who he/she works for be justification for sacking. Seems a restraint on free speech to me, no matter what he said. In such cases where is the line between personal and work life, effectively there is no work/personal split and work dominates your entire life. I suppose as I have a public profile and represent the Perth Mint, I operate under the same expectation. Might just need to have a detailed read of our social media policy. Maybe just easier to start a new anonymous blog so I can rant away. I think a swap is the most likely and as Ronan notes such loco swaps between central banks occur often. The question is whether it was the US or Germany or Netherlands that requested the swap and who else was on the other side of the swap - I'd agree Bank of England is best candidate. A possible rework of the repatriation schedule from my last post is below. The numbers can work with Germany not doing a swap and it being the Netherlands that did the swap but you can mix up the numbers any way. Koos reported that the Netherlands started in October which if true means they must have swapped something as only 99.45t came out of FRBNY over the last quarter and even if you include the 7.37t as a late Sep shipment for Netherlands, which could be consistent with a general statement about an October start, they still had to swap circa 31.65t. On the side of Germany having done a swap is their reporting of them utilising BIS' "expertise", as the BIS is involved in facilitating transactions in the gold market. The 10.31t figure for Dec gives both Koos and Boehringer something to question the two governments about who swapped - either way Germany or Netherlands has not fully explained that they did not physically repatriate ALL of the gold from the US. Hopefully they can get to the bottom of who misrepresented by omission. "January till November 2014 the FRBNY was drained for 166 tonnes, if we subtract 123 tonnes The Netherlands got out that leaves 43 tonnes for Germany. The fact Germany claims to have repatriated 85 tonnes from New York in 2014 means they must have pulled 42 tonnes from the Manhattan vaults in December. By the end of this month (January 2015) the FRBNY will release the foreign deposit data of December and we’ll see if the numbers match." So given the data from FRBNY, how can we construct 123t and 43t (or 85t for the year). I found it interesting that in Koos table 5.16t is repeated three times, that the Feb 2014 10.31t is basically double 5.16t and that the Aug 2014 15.47 is basically 3 times 5.16t. So working from this I get the following breakdown of the FRBNY withdrawals. Is it possible given the somewhat random nature of 400oz bars (assuming that is what Germany and Netherlands are getting) that every shipment exactly equals 5.16t or multiples thereof? (I note that the figures are rounded to 2 decimals, so there could be some small variance if it was shown to 3 decimals). 5.16t means over 400 bars that every bar is overweight. I haven't had time to check the US Mint bar list (see here and here) to see whether their distributions shows this tendency to overweight. Maybe the coin melt or whatever non standard bars Germany and Netherlands are getting are exact weight bars, hence the identical shipment weights? 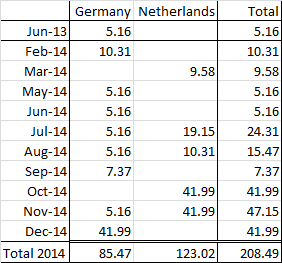 If Germany has been doing 5t every month or so, why the rush to do 42t in December? Would it have not been easier to just do a few 10t months and spread the work out. Note that in the Bundesbank release they say that "As soon as the gold was removed from the warehouse locations abroad, Bundesbank employees cross-checked the lists of bars belonging to the Bundesbank against the information on the bars removed" so that is a lot of work for December - 3360 bars to check - rather than just 400 or 800 bars per month. Why would the need the expertise of the BIS? Why do you need to do a "spot check" if Bundesbank employees are cross-checking every bar anyway. What was the "spot check" - given point above it isn't a check of the weight and bar number on the bars to the bar list as that is already being done. It can't be an assay check as they would have said that explicitly and in any case if anyone should help with that it should be someone from the refinery doing the reprocessing, not the BIS. All I can think is it was weighing the bars (that weren't being reprocessed) on a scale to check the weight was correct to the bar or bar list. Do you really need the BIS to help with that? I'll just reiterate what I said on 20 January 2014 and 21 January 2014, it is all one big central banking club and as Jim Rickards said, it is all just a "political sop to agitation in Germany's parliament" and there isn't any concern on Germany's part as to whether the US has their gold, and if there is, they can't be seen to be concerned, lest the Narrative of Central Bank Omnipotence be questioned (even more so after SNB dropped its peg). Chris Powell characterised my post on marginal miners as "straining at gnats while swallowing camels". It is an accusation of hypocrisy, that I'm being "very strict and precise in smaller matters of the law, but careless and loose in weightier matters" (see here for an explanation of Chris' use of Matthew 23:24). I'm entitled to a defend myself I guess. Firstly, Chris said my post "argues today that gold's price is being kept down in large part". In large part? The very title of my post said "Gold price may be affected" and I said "this may crimp increases in the gold price" I think that is enough "may"s to qualify my statement and make "large part" an unfair representation of my post. Chris goes on to say that I "overlooking central bank 'production'" and that it is "exceedingly hard to get respectable people to discuss that part of the market". In other words, that I focus on smaller matters while ignoring weightier matters. I assume that Chris is not arguing that gold commentators are only allowed to post on central bank camels and cannot post on smaller gold gnat issues. Therefore I guess he is commenting on my overall 6 plus years of commentary on this blog. Certainly I do focus on detailed technical issues - that is where my expertise lies. It is also partly because that is an area few cover, while almost all other blogs cover GATA's central bank camels extensively enough, so I look to offer something different to those who are looking for a gnat level understanding of the gold market. But Chris' point is that "respectable people" aren't discussing it. Now I don't take it he means the majority of gold commentators are not respectable, but that the mainstream doesn't consider them respectable and will only listen to those it considers respectable. I'm guessing that Chris' comment is that given I work for the Perth Mint that makes me respectable in the eyes of the mainstream. Unfortunately I don't think the mainstream would consider what I say on gold to be respectable and would consider me hopelessly conflicted as my employer makes money from selling gold and thus from a higher gold price. The Bundesbank & the Narrative of Central Bank Omnipotence: central bankers use ... use public statements to play the Common Knowledge Game and drive market outcomes by proxy." Reserve Bank of Australia Gold Sale: governments will want to be re-elected. Rather than take the tough decisions, they will turn the inflationary tap back on. For that reason, I believe that gold will again have its day. To roll or not to roll, that is the central bank's question: Moves to return gold are eminently sensible, of course: what is the point of a country having its gold out of its immediate physical control if everything goes to hell. That is really the whole point of having gold reserves. And finally, Australian Gold Confiscation, where I drew attention to a previously ignored mechanism by which the Reserve Bank of Australia could enact confiscation in Australia. I would argue the above is plenty of drawing attention to camels, particularly for someone who whilst speaking on this blog personally, still works for a government where politically neutrality on policy matters is expected. Tone is very hard to get in the written word, so let me say I'm not at all fussed by Chris' comments - I can take as good as I can give - and I don't expect Chris to have read all of my 450 blog posts and understand where I'm coming from. Hopefully, Chris, you'll reconsider your J'accuse? Izabella has a post on FT Alphaville on the changing structure of the oil market. The point of interest for me is that the speed with which shale oil can be developed, as well as shut down and restated, means that "the clearing price of oil in a shale world needs to be much, much lower to dissuade unnecessary investment, and also needs to rise much less significantly to encourage it when it is necessary". The take away for the gold market is that the run up to $1900 no doubt resulted in a lot of marginal gold mines being developed that probably shouldn't have been. At current prices these are not profitable on an all in basis but they are holding on as prices do cover marginal cash costs. We need a much, much lower price to really kill this potential supply but this hasn't happened - we haven't seen large numbers of bankruptcies or care & maintenance mothballing occurring. The fall in the oil price will probably give these mines some breathing space. As the money spent on developing these mines is a sunk cost, the problem is that they will stay around and we only need the price "to rise much less significantly to encourage" them to continue producing gold on a cash costs basis. The result is that this may crimp increases in the gold price compared to the situation where a lot of the sub-standard projects would have been cleaned out and the potential for increased supply on any price increased would have been muted. Rick Rule has been talking about how few listed junior miners are worth investing in. Unfortunately the oil price drop may mean that the others don't "go to company heaven" resulting in a sideways gold price as they keep on producing any time the price shows strength and affecting the marginal supply/demand balance.